Family holidays are a special time. You know all too well that these years with the whole family together are precious and you want to enjoy every moment. Our selection of family cottages offer you the perfect setting for family fun, relaxation and for creating those special family memories that will stay with you forever. Set in the stunning Herefordshire countryside, Holt Farm is a collection of four family cottages, each with its own character and each suitable for different family group sizes. 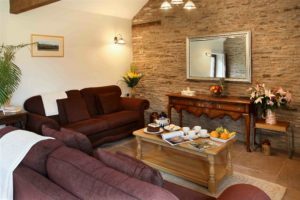 You can book one or a combination of our cottages to best suit your needs; the cottages are able to accommodate up to 22 people with ample space for everyone to dine together, ideal for much larger family groups. The cottages can also be booked individually and sleep 8, 8, 4 and 2 people each. Holt Wain House is a character cottage at Holt Farm, accommodating four people and ideal for a family holiday. With level access through, Holt Wain House is particularly well suited to smaller children and guests who prefer a cottage without steps and stairs.The cottage has a lovely feel to it, having been restored from a former horse-drawn cart house to a light and airy four-star accommodation for families. With plenty of outdoor areas, there’s lots of space for the children to play. There’s also an outdoor Hot Tub, barbecue and outdoor furniture for a lovely family meal ‘al fresco’ – perfect for the summer months. Holt Farm House is a rustic cottage at Holt Farm which sleeps up to 8 guests. With its own private patio and Hot tub, garden and enclosed lawns, it’s a lovely rustic cottage for a larger family group to enjoy and has dining space for up to 12 people. Find out more about Holt Farm House here. We regularly welcome larger family groups who book one or more of the Holt Farm family cottages to accommodate more guests. By booking a combination of our cottages, you can accommodate up to 22 guests – which is why Holt Barn has a generous dining space for all your group and often becomes the social hub for large family holidays. There are lots of child-friendly activities throughout Herefordshire, from soft play areas to the Herefordshire trail. Take a look at the Days Out with the Kids website for more ideas too. There are excellent catering options available to you. With plenty of kitchen space, the Holt Farm cottages are great for those who prefer a self-catering family holiday and there are lots of lovely shops in the nearby towns to meet every taste. The area is well known for its delicious culinary delights, so do try the local stores for some lovely treats at Hopes of Longtown. If you’d prefer to eat out, the local restaurants offer a range of cuisines; we’ve shared some of our favourites here.